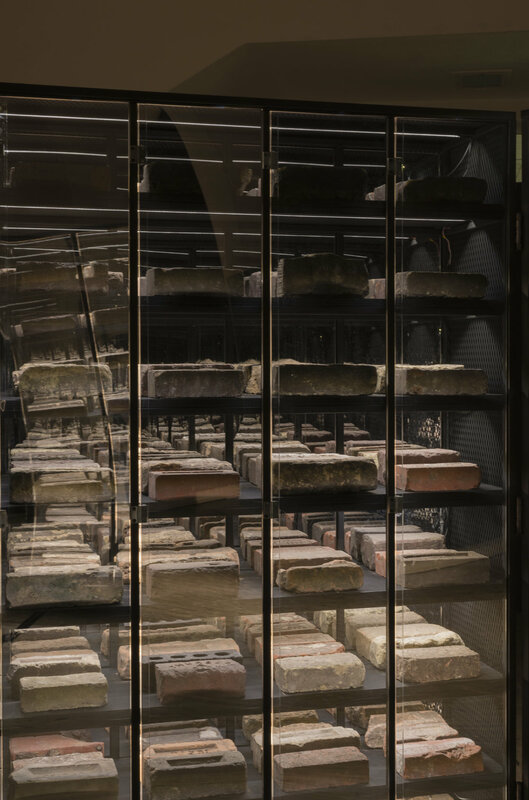 Earthly Bodies: The Houston Brick Archive highlights a large collection of bricks salvaged from sites around Houston over the past two and a half years. The bricks are studied from various angles, their origins traced, and their qualities explored. They are treated as invaluable ruins, processed in a way that is scientific but also impulsive; walking a line between curiosity and fetishism. 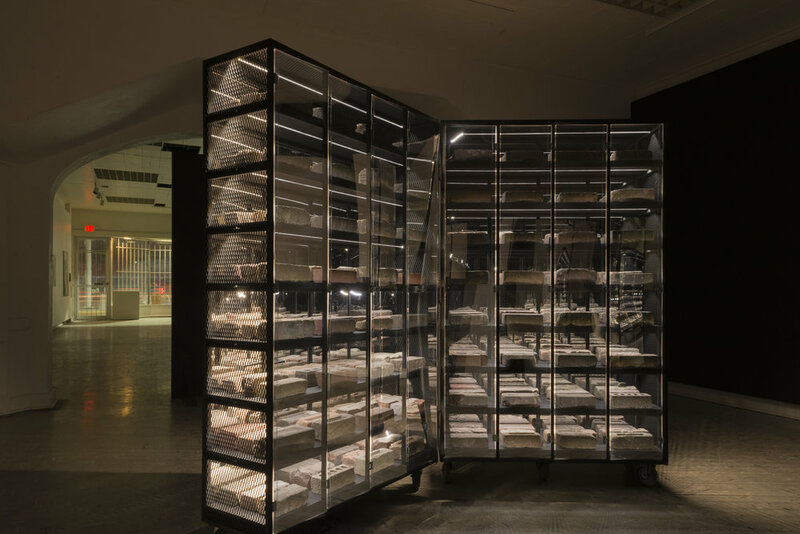 Part theater, part research project, the Archive combines sculpture, photography, and other documents focusing on the bricks’ physical qualities and histories; an investigative video reverts the bricks back into terrain, and visitors may make their own rubbings of selected bricks. The almost obsessive approach to the bricks creates an exaggerated sense of their significance, even romanticizes them. 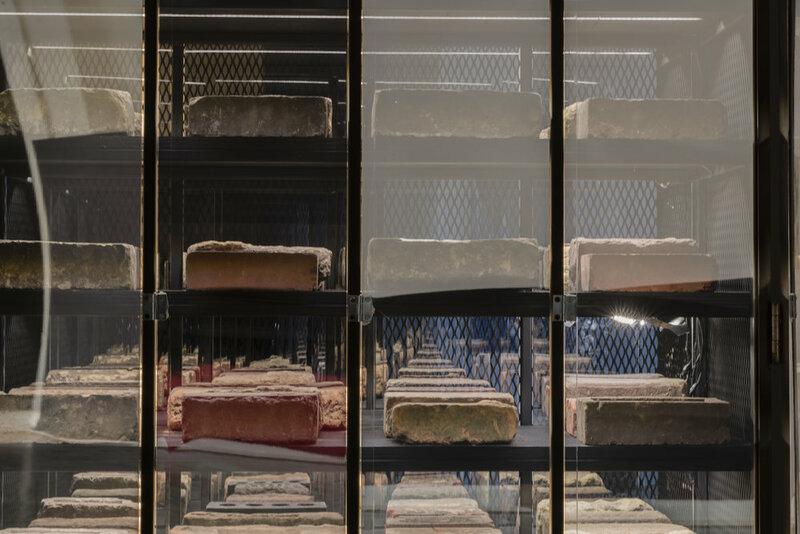 By tracing their origins and migrations to become part of Houston, the bricks can serve as a metaphor for change, migrations, and the diverse and dynamic fabric of the world. Fabrication for this project was managed and executed by Bob Bacon (Bob Bacon Metal Art) and Nick Vaughan. The brick soundscape was composed by Edwin Terrell. The Houston Brick Archive was funded in part by the City of Houston through Houston Arts Alliance. Starting while still living in Boston in 2013, I collected old bricks and other "samples" of materials. Things that had become completely torn from their original place. 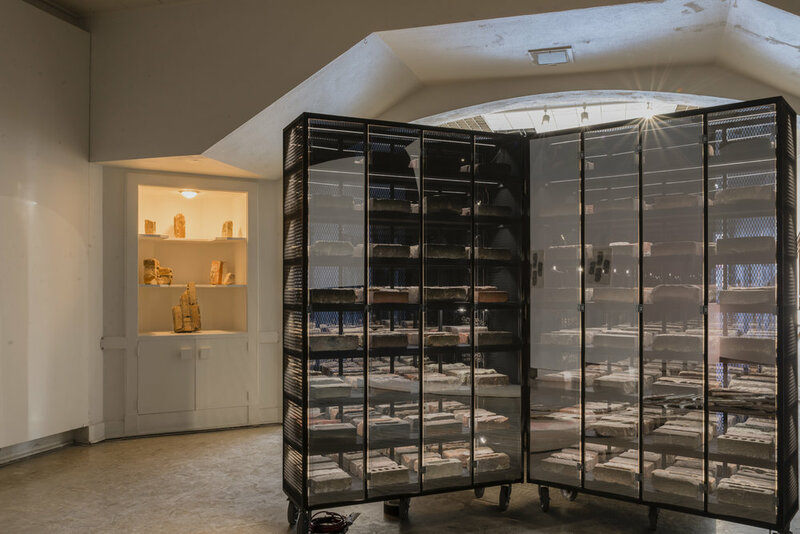 After returning to Houston in the late summer of 2015, I began work on the Remnants / Visions project in Sharpstown, excavating and converting a 1959 ranch house into an archaeological museum of sorts. During this project, with the help of local art students, family members, and friends, we salvaged around 1,500 bricks. I was struck by the large quantity of the bricks that were from Mexico. At this time, when immigrants from Latin America are scapegoated and targeted unfairly, the idea that homes in the United States could be, and were in some places, composed of Mexican earth was both humorous and maddening. It made me think of the inextricable history between Mexico and Texas, of the all the history that has transpired across all of the Americas over centuries and millennia. I continued to accumulate and have amassed a collection of several hundred bricks from various sites around the city. They are artifacts to me, ruins of the present, and I process them accordingly: I photograph them, take rubbings of their surfaces, and research their origins. I find the diversity of bricks in Houston to be fascinating, they hail from all over the state, from Oklahoma and Illinois, as well from several manufacturers in Mexico. For me, comparing the movement of actual Earth (in the form of bricks) across space and time to Houston, serves as an apt metaphor for migrations of people across the planet. Over the grand span of time, borders do not exist, and the landscape itself changes, rendering any notion of claim or ownership or entitlement temporary and trivial.